From the President: "That's WY"
Earlier this spring I traveled to Chicago for the Higher Learning Commission (HLC)conference with several staff and faculty from Northwest College. It was great to spend time together and learn more about HLC and accreditation processes. 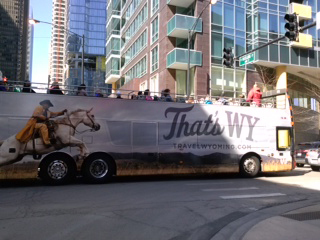 As faculty member Aura Newlin and I were walking from the 'L' Train to the conference hotel, we cheered when the "That's Wy" bus drove by. We thought it was a thoughtful was a way for Chicago to welcome us to their city. I learned last week that the summer season United flights from Chicago to Cody are filling up. That's Wy!